However, profits from non-recurring items were $20 million, decreasing from $119 million in the same reported period last year. “PTTEP is moving forward with the new Expand and Execute strategy, which we’ve actively implemented since earlier this year and have successfully achieved several major milestones,” Phongsthorn said. “This will help boost sales volume and sales revenue immediately,” Phongsthorn said. “PTTEP were awarded additional two offshore exploration blocks in Malaysia as well. Under the “execute” part of the strategy, PTTEP’s priorities are to increase production volumes and add value to its existing projects. The country’s No 1 mixed doubles pair, ranked fourth in the world, narrowly lost the opening game 24-22 in the second-round match but upped their concentration to take the second and third 21-16 21-17 and edge through. The Thai duo enter the showdown with a 2-0 lifetime record against the opponents. Also moving into the last eight were the women’s pairing of Jongkolphan Kittitharakul and Rawinda Prajongjai, who eased past Anna Ching Yik Cheong and Lim Chiew Sien of Malaysia 21-15 21-18. A Herculean task awaits them on Friday, however – their next rivals are world No 1 Yuki Fukushima and Sayaka Hirota of Japan. The Thais have won just two of their eight previous meetings with the reigning champions. The family says the man has frightened the children by threatening them in various ways over the accusations. Chumphon governor Wiboon Rattanapornwong yesterday sent provincial social development and human security office head Wallapa Kaewsawi and related local officials to visit the family’s house to provide aid to the children. Three of them agreed to speak with the officials but the 14-year-old was reportedly so traumatised she refused to talk with anyone. She further claimed that Surin then offered her Bt20,000 not to mention the allegations to anyone and she accepted as her family lived on his land. She took it as a threatening gesture and added that it made the family worried that they might not get justice. Organisers invite runners, foodies and travel junkies to join and experience Asian lifestyle journey where two cultures, Thai and Chinese, meet. Kilorun Bangkok 2019 consists of two categories. The first category, Kilorun-KM, features two types of races – the L-Run (10 km) and M-Run (5.5 km). Moreover, Kilorun has announced two new routes in Osaka, Japan, on October 22 and in Chiang Rai on November 24. For more information and reservation, visit Kilorun 2019’s Facebook, Line, Twitter and IG feeds. Moon was also working on wooing North Korean leader, Kim Jong-un to attend the South Korea-Asean commemorative summit this November. Speaking to editors from Asia News Network (ANN), Moon said the failure of the second summit between US President Donald Trump and Kim Jong-un was a great disappointment the world over. The meeting between Kim and Russia’s President Vladimir Putin yesterday was also a positive trend for the Korean Peninsula, he said. Asked if Indonesian President Joko Widodo’s idea to invite North Korea’s Kim to the Asean-South Korea commemorative summit in November would come to fruition, Moon said he was working on it. All the members of Asean would first have to agree to such a meeting, as would Kim. As a student of religion, Ye Olde Theologian advocates teaching comparative religion in schools when adolescents’ “brains should be mature enough to grapple with philosophical concepts”. Alas, the fact is that most children are indoctrinated (usually) into the religion of their parents as infants. It is also a fact that, as many adolescents mature and begin to “grapple with” these concepts, they soon work out that religion is childish, superstitious nonsense. As an atheist I, too, am unsure of what lies beyond life or how life began, but what I am sure of is that religion doesn’t provide answers. The “text” of religion is not the word “of god” but man-made superstitious mumbo jumbo. At that time, the princess visited the Baan Nayao Border Patrol Police School and asked us what we mainly grew in our area. The princess then asked whether the soybean could be processed for human food as well as for animal feed. “This sewing women group was formed in 1998 and started by producing 500 student uniforms for the provincial Red Cross for three years. Today we have 34 members and we each earn between Bt3,000 and 4,000,” says Rayong Phuangthaisong, chief of the Baan Nayao Sewing Women Group. The Office of Princess’ Project suggested the group produce herbal tea and herbal compresses. When politicians and bureaucrats are corrupt or incompetent or both, taxpayers are the ones who suffer most. From 1992 to ’96, the project ran into financial and liquidity problems as well as technical hitches, resulting in protracted delays. In 1997, construction work came to a halt at the height of the Asian financial crisis. In 1998, the Cabinet approved a resolution to scrap the deal because the project’s construction work, after seven years, was only 13 per cent completed. Hopewell subsequently sued SRT for compensation of Bt56 billion, while SRT filed a counter-suit seeking Bt200 billion in compensation. Thailand will host more than 70 major Asean meetings this year, with an additional 200 supporting meetings also on the cards. As such, Thailand’s plans for more environmentally friendly Asean meetings are applauded by many. Singapore pioneered the use of digital and electronic tools last year with its “paperless” Asean meetings. This calculation demonstrates that shifting from conventional paper-based meetings to green meetings has a big impact on energy efficiency and CO2 emissions. As well as chairing Asean, Thailand is also heading the Asean Energy Efficiency and Conservation Sub-sector Network in 2019. However, they agreed that speeding up the end of life medically is a form of suicide. Dr Issarang Nuchprayoon, a medical lecturer at Chulalongkorn University, said most people view end-of-life medical care as both painful and expensive, with doctors focused only on keeping the patient alive as long as possible. Living will can dictate palliative careMercy killing is another story, he said, as it seeks to rush a person’s death by ending their life to avoid illness-related pain. Sawaeng Boonchalermwipat, National Health Commission Board member, said mercy killing was not a legal option in the Kingdom. He suggested that everybody write a living will to prepare for their inevitable final period. THE OFFICE of Ombudsman has demanded that the Hazardous Substance Committee (HSC) clarify within 60 days whether it will ban the widely-used but dangerous herbicide paraquat by the end of this year. “Our goal is to ensure that the total ban goes into effect from January 1, 2020,” the office’s secretary-general, Raksagecha Chaechai, said. At yesterday’s meeting, HSC representatives said farmers were still allowed to use paraquat because they were familiar with it and also because there was no practical alternative available. If it does not intend to ban paraquat from January 1, then it will have to present clear and adequate reasons,” Raksagecha said. “If he is serious about addressing the danger of these chemicals, he should have told HSC to ban those chemicals,” BIOTHAI said. WASHINGTON - "I don't see Joe Biden as a threat." "Because of his blue-collar strength in states Trump won in 2016, Biden is a real threat to Trump," said Larry Sabato, a political scientist at the University of Virginia. 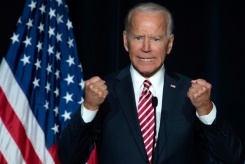 I said, 'If we were in high school, I'd take him behind the gym and beat the hell out of him,'" Biden told an audience at the University of Miami last year. "Joe Biden got tongue tied over the weekend when he was unable to properly deliver a very simple line about his decision to run for President," Trump tweeted. Trump meanwhile has attacked Biden as part of the political old guard that is out of touch and has nothing new to offer the country. The waiver of the Bt2,000 VOA fee will be extended from May 1 to October 31. The fee had previously been waived until January 14 in a bid to boost tourism. Waiving the VOA fee had reportedly helped increase foreign visitor numbers. Meanwhile, waiving the VOA fee resulted in the government losing Bt2.95 billion in revenue but it helped to draw more foreign tourists, who generated an estimated Bt104.6 billion in tourism revenue. VOA is available to tourists from 21 countries and regions, including China and India. Dtac launched the “Never Stop Caring” campaign to increase the number of users on the 2,300MHz network, for improved mobile internet. At the end of Q1 2019, the total subscriber base stood at 20.7 million, and the number of 2300MHz base stations reached 15,400, an addition of 2,700 base stations during the quarter, the firm said. Approximately 7.8 million subscribers, or 76 per cent of 4G subscriber base, were on the 2300MHz network. Overall network coverage stood at 94 per cent of the total population, Dtac said. Moreover, the financial position remained solid, with net debt to EBITDA ratio of 1.3x and cash on hand of Bt12.8 billion.